The Dominican Republic brought a Latin beat to The Canadian Tire Centre in Ottawa during a match between the Ottawa Senators and Carolina Hurricanes. Costumed merengue dancers, live traditional music, virtual reality glasses, gifts and a beach bar with Dominican drinks were on hand. The merengue dancers and the live musicians gave spectators the feeling of a night out in Santo Domingo’s Plaza España. The information booth was representative of the popular eco-tourism destination of Samana and the “beach bar” showcased an all-inclusive experience in Punta Cana. The booth also featured a Dominican vending machine that gave fans vacation-themed gifts if they answered various questions correctly. 17-year-old Indira Acosta Jose treated fans to a rendition of the famous merengue song, Entre tu Cuerpoy el Mio, originally sung by renowned Dominican singer, Milly Qezeda. 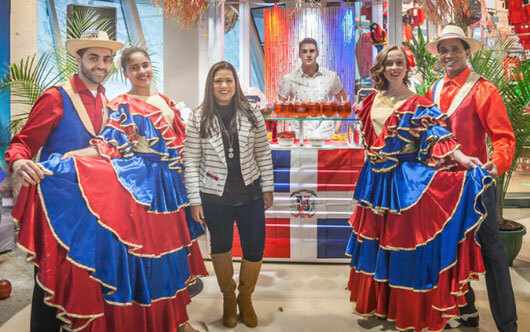 The Dominican-themed night was part of a series of celebrations to thank Canadians for visiting the country.